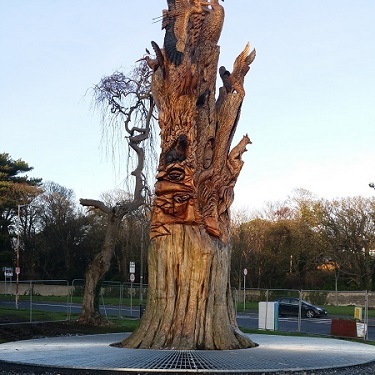 As St. Anne’s Park is the largest recreational park in the Northside of Dublin and is used by thousands of people yearly, we decided to enhance the landmark tree sculpture at the edge of the park on the Howth Road. This tree is approx. 100 years old and rather than letting it deteriorate following storms and the ravages of being beside the coast, DCC Parks commissioned an international tree sculptor, Tommy Graggs, to decorate it. His brief was to represent the Biodiversity of the area in three levels – Air, Land & Water, showing various forms of wildlife and sea creatures, and then sealed it with a type of protective wood oil. Following this, and with the interest shown in the tree by the many pedestrians entering/leaving the park and the many people passing by, DCC Parks decided to protect the base of the tree with a steel grid so that people could get a closer look in comfort to admire all the carvings. This was designed in a circular motion to match the design of the nearby low wall, and the curve of the tree. We had to design the grid and consult with Galco , Hot Dip Galvanizers, so that it could be Galvanized. We fabricated the grid in 8 pieces for ease of transport and dipping. Because of its toughness and unrivalled corrosion resistance, hot dip galvanizing was the best method of protection for an item such as this from the elements, especially being so close to sea. We are delighted with this decision and how the whole area has been enhanced, the tree has many more years, the grid will have a longer lifespan due to being hot dip galvanized, and many more people will enjoy all the features on the tree, and there are more carvings to be inserted on the tree soon.